A perfect addition to any party is the "wow" element. 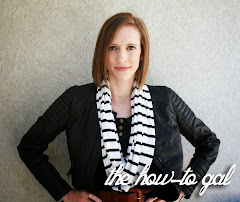 Today, I'm heading back in time to share an oldie, but goldie - one of my very first posts on this blog from 2009! 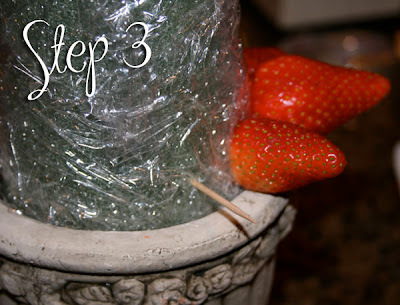 Wrap your cone with plastic wrap and secure to base. 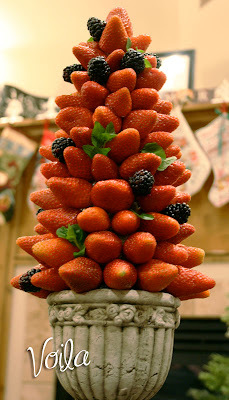 The cone will get pretty heavy with all of the berries stuck into it, so make sure it is securely attached. Insert the toothpick into the foam first and then secure the strawberry on the pick. Helpful hint: I tried this two ways- inserting the toothpick in the foam and inserting the toothpick into the strawberry and then into the foam. Toothpick into foam first works best. 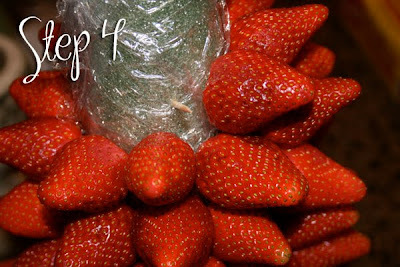 Keep inserting the toothpicks into the foam and securing strawberries in a circular pattern up the cone. 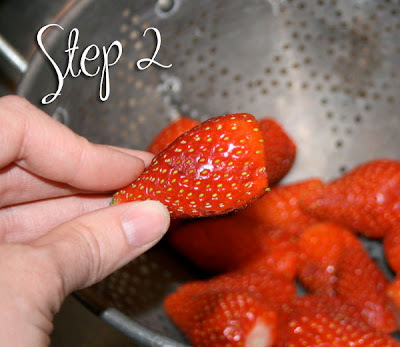 Try to stagger the berries to prevent bare spots. There will be bare spots...trust me...so have a different kind of berry (smaller is better-I used blackberries) to fill in. After you have filled in the larger bare spots, go back around and fill any other areas with mint leaves. Voila! A gorgeous centerpiece for your next party. Perhaps melt a bowl of chocolate for your guests to dip their strawberries in for an added touch! That is fabulous! I am defintely going to use this for some upcoming parties. Thanks for the tutorial. Love this! I'll definately be using this idea for my 5yr daughter's bday party! She loves fruit! Thank you! Wow! So pretty and looks so tasty. Thanks for the great idea. This is amazing! yummy and beautiful ! It did turn out beautiful and everyone enjoyed the berries with the chocolate. Thanks Anna Rose! Man I want that right now!!! I'll be linking! This would be great for a fondue party! Thanks! This is AWESOME! And beautiful. I've featured it at somedaycrafts.blogspot.com I want to make one today! 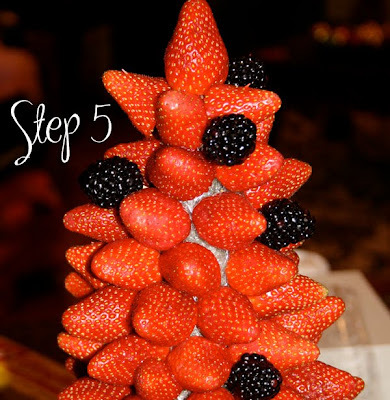 This is great, I hosted a Mother's Day Tea for the Grandma's last year and did fruit kabobs but I am so going to make a Strawberry Tree this year. One question, when you say secure cone to the base do you mean with something like hot glue or just make sure you really jam it in? Good question, sorry I didn't make that clearer. My base had an opening that the cone fit in so I just jammed it in so that it fit snugly. But if your cone doesn't fit inside of your base or your base doesn't have an opening, you would need to secure it with something. Hot glue would work fabulously or if you need something really secure, super glue or gorilla glue.